The wholesale plagiarizing of ancient Near Eastern literary themes didn't end with the Old Testament 's reworking of much older cuneiform stories in Sumerian (4,000 – 2,000 BCE) and Akkadian (2,500 BCE – 100 CE) which recorded The Creation Epic (Enuma Elis), The Flood (Sumerian), The Story of Gilgamesh, The Decent of Inanna / Ishtar to the Neither World (Jewish Sheol and Christian Hell) and The Legend of Sargon (the basis for Moses' birth story). However, many people are not aware that the plagiarizing of established pagan myths can be found in the Bible from Genesis to Revelation. For example in the Book of Revelation, the wild end of times depicted in the apocalyptic visions of John of Patmos were supposedly given directly by God, “The revelation from Jesus Christ, which God gave him to show his servants what must soon take place. He made it known by sending his angel to his servant John, who testifies to everything he saw—that is, the word of God and the testimony of Jesus Christ. (Rev. 1: 1- 2), but much was simply stolen directly from other ancient religions directly condemned by Yahweh. 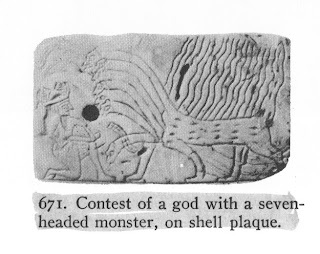 Left: A small white shell (pierced for hanging) shows a contest between a God and a seven-headed fiery dragon. 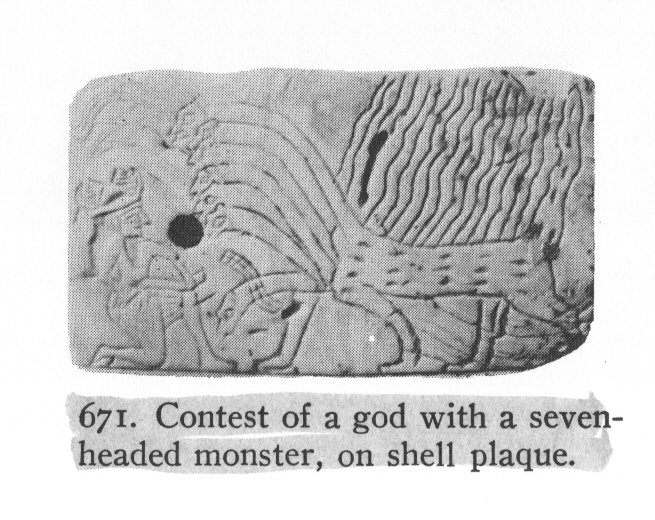 The God kneels before the monster which has the body of a loin with seven serpent heads. Flames arise as tongues of fire on its back. (Akkadian Period: circa 2,000 BCE). 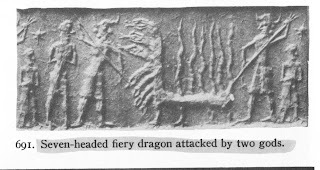 Left: A seven-headed fiery dragon is attacked in front by a God with an attendant and from behind by another God and an attendant. 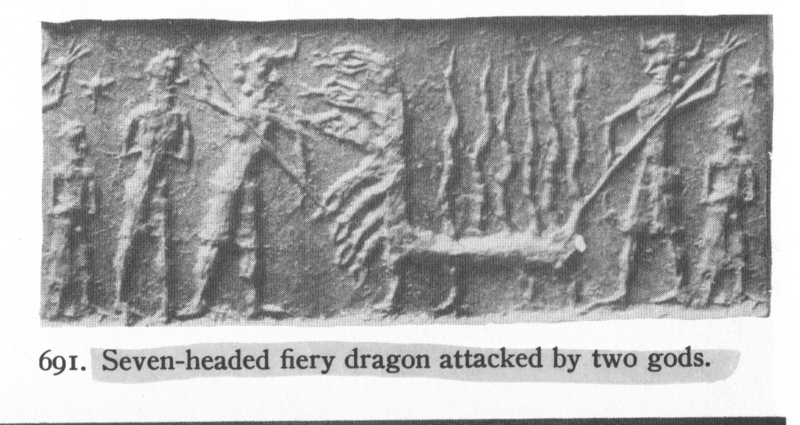 Three of the heads of the dragon are alive and still fighting while four of its heads hang limp and defeated. (Akkadian Period: circa 2,000 BCE). 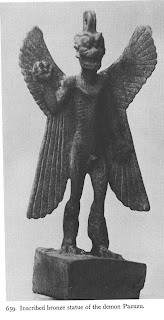 Left: An inscribed statuette of the demon Pazuzu which has the feet of an eagle, the body of a man, the claws of an eagle for hands, with eagle wings with a dog's face. (Akkadian Period: circa 2,000 BCE).